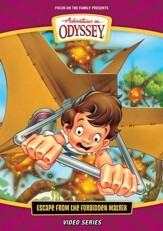 This complete collection includes four exciting episodes of Adventures in Odyssey New Series, plus supercharged extra features. • "The Last Days of Eugene Meltsner"
• "The Caves of Qumran"
• "Escape From The Hidden Matrix"
• "The Mortal Coil I-II"
• "The Treasure of LeMonde"
• "The Underground Railroad I-III"
#1 The Last Days of Eugene MeltsnerA supercharged show with a powerful lesson about trusting God. #2 Escape from the Forbidden MatrixDylan learns about priorities and the dangers of wasting time when he and Eugene get stuck in a computer game. #3 The Caves of QumranFind out why life's greatest treasure is more valuable than gold in this high-action, adventure-filled episode. #4 Race to FreedomOn a trip back to 1856 in the Imagination Station, Carter is mistaken for a runaway slave, and Dylan learns that every person is valuable to God. Q: How long is each episode? 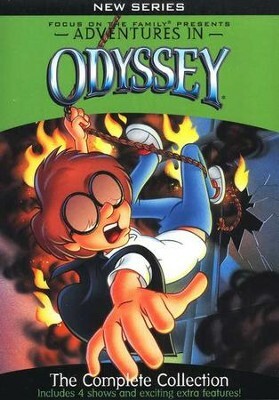 In the Adventures in Odyssey New Series that features:The Last Days of Eugene MeltsnerThe Caves of QumranEscape From the Hidden MatrixRace to FreedomPlease tell me how long each episode is. They are roughly 30 minutes each. Q: Is this an audiobook series or a DVD series? 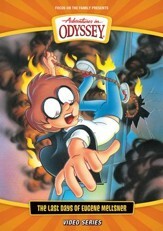 This is a DVD series which you would watch on a TV. 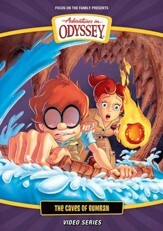 I'm the author/artist and I want to review Adventures in Odyssey:® DVD Gift Pack.